Hot on the heels of the successful Castrol Asia Pacific Cars Super Mechanic Contest 2018, Castrol continued its pursuit for the best mechanic, this time in the two-wheeler edition, through its Castrol Bikes Super Mechanic Contest 2018. Clinching the top spot was the Southern team who after four months of intense competition, were crowned champions. They edged out close to 2,000 other mechanics from across Malaysia. The winning team, comprising Saravanan A/L Sivarau, Tee Kok Jing and Sivanathan A/L Lechumanan took home the grand prize worth RM12,800 each after outperforming five other teams in the competition’s Grand Finale. Both Saravanan and Sivananthan are from Soon Tat Motor Enterprise while Tee Kok Jing represents Sin Yung Hin Motors. One of the competing teams showing their skills at the Malaysia leg for Castrol Asia Pacific Bikes Super Mechanic Contest 2018. The Malaysia leg of the Castrol Bikes Super Mechanic Contest 2018 kicked off in April 2018 with a nationwide search for the best mechanics. A total of 18 mechanics, who formed six teams of three each, ultimately made it through to the semi-finals. At the semi-finals, the six teams were initially tested on their theoretical knowledge. The top three teams moved straight into the practical session while the others incurred a seven minute time penalty before moving to the practical session. These teams then competed together in a practical knowledge challenge that ultimately crowned the best Castrol Bikes Super Mechanic Team in Malaysia. Members from The Automotive Education & Technical School, School of Skills, was present to lend their expertise in the judging panel. One of the competing teams during the theoretical knowledge challenge at the Malaysia leg for Castrol Asia Pacific Bikes Super Mechanic Contest 2018. The winning team will represent Malaysia at the Castrol Asia Pacific Bikes Super Mechanic Contest 2018 in Bangkok, Thailand, this coming November, where they will go head-to-head with top mechanics from Thailand, Vietnam, Indonesia, Philippines and India. 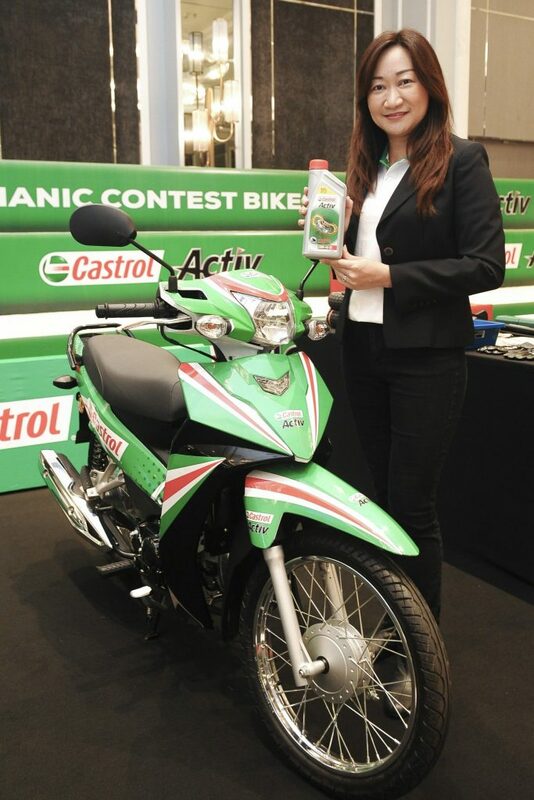 Speaking at the event, Keow Mei-Shan, Marketing Director Malaysia said “Castrol prides itself as being a name that is at the forefront of up-skilling and encouraging the unsung heroes of the nation – the mechanics. We recognise, acknowledge and reward them for being experts in their field. We are extremely proud of the champion team which will go on to represent Malaysia at the Castrol Asia Pacific Bikes Super Mechanic finals and wish them all the best”. Keow Mei-Shan, the Marketing Director for BP Castrol Malaysia at the Malaysia leg for Castrol Asia Pacific Bikes Super Mechanic Contest 2018. “We are grateful to Castrol for the opportunity to showcase our talent and even learn new tricks of the trade from other participating mechanics. Thank you Castrol for giving us the opportunity to continuously better ourselves and get our names out there. We will carry the spirit of “Malaysia Boleh” strong and proud at the Castrol Asia Pacific Bikes Super Mechanic finals” said both Saravanan and Sivananthan of Soon Tat Motor Enterprise. Both 1 st Runner Up & 2nd Runner Up positions were awarded to the Central region. To find out more about Castrol and its products, visit www.castrol.com/my.